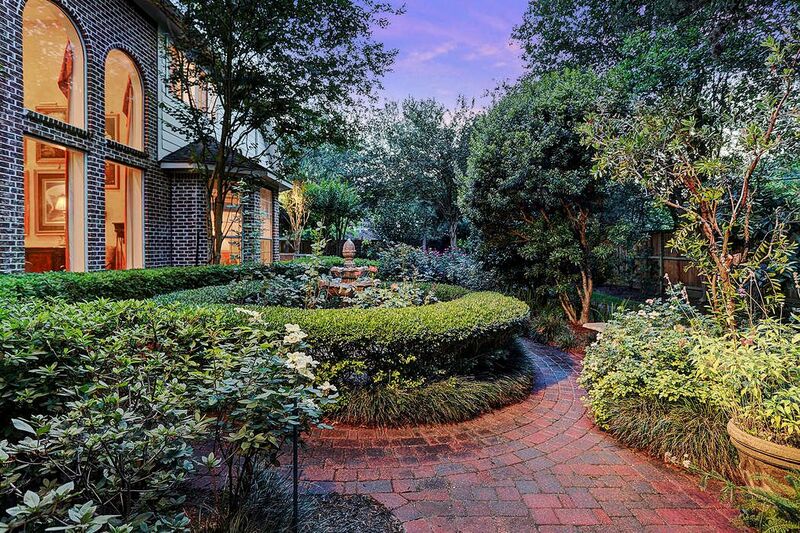 316 Bunker Hill Road, Bunker Hill Village, TX 77024 | Martha Turner Sotheby's International Realty, Inc.
A gorgeous view of the lushly landscaped backyard with multiple areas (both covered and uncovered), gardens and green spaces. 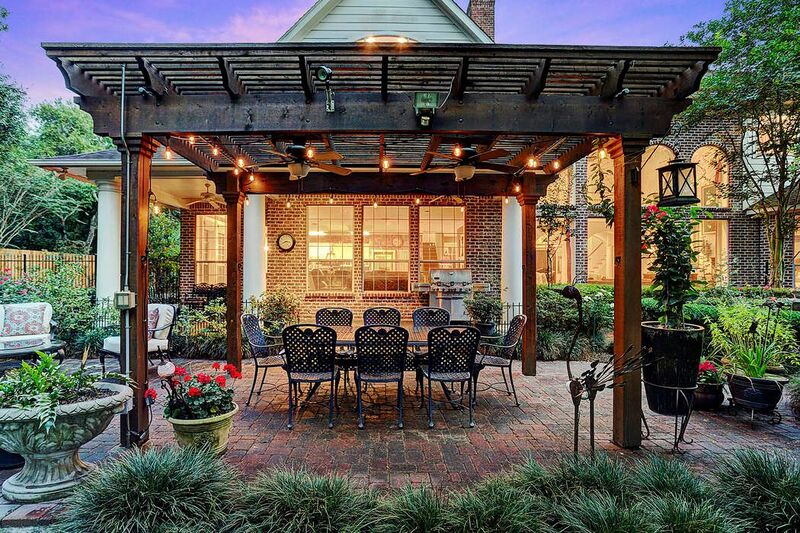 Note the pergola ideal for dining "al fresco" when the weather permits. 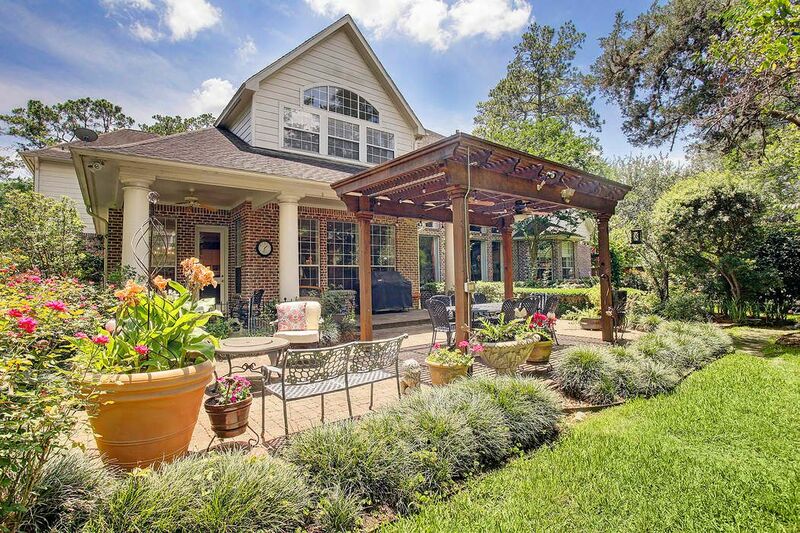 Welcome to your dream backyard! The pergola with dual ceiling fans is a great place for casual outdoor dinners even in the warm Texas climate. Time for creating memories with family and friends. 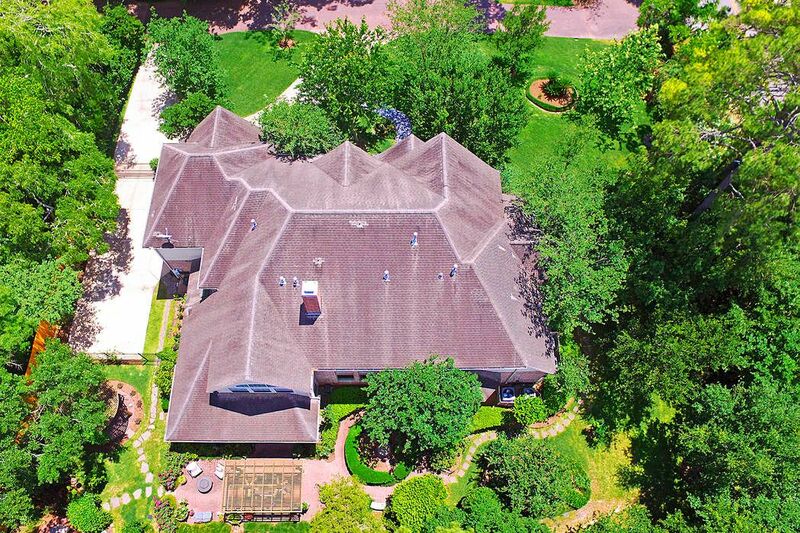 An aerial view of the home from the backyard which is at the bottom of this image. Note the lush, professionally landscaped side and back yards. The yard to the right of the image (west side) is perfect for a future swimming pool if desired. Solid wood front door with dual leaded glass side lights, wifi "Ring" system (remains with property) and four grand columns welcome family and friends. 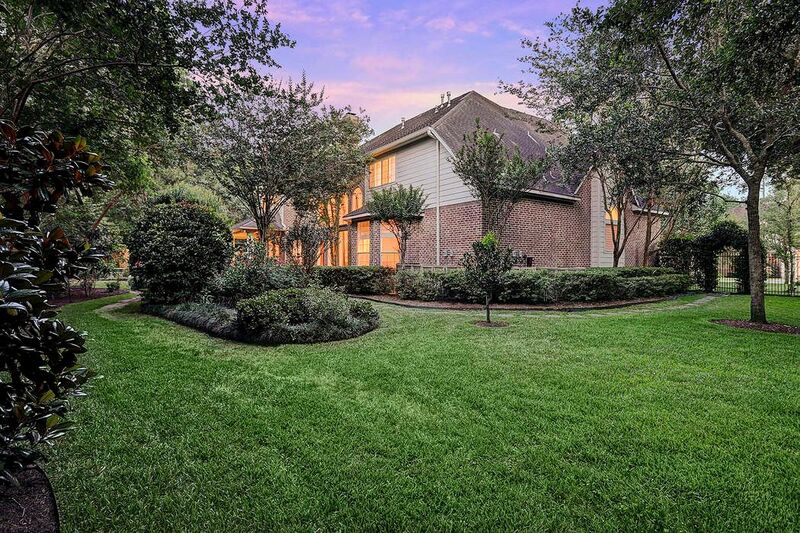 Note the professionally landscaped front beds making this home move in ready! The Library Loft is located at the top of the front staircase and opens to the Library/Study below. Wonderful space for books and collectibles alike. Paint 2018. 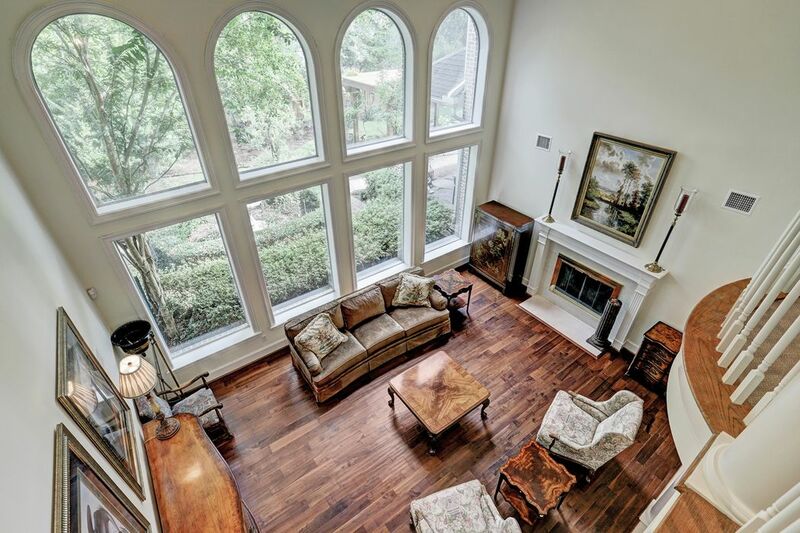 The formal Living Room as viewed from the Gallery, through the wall of windows overlooking the serene backyard complete with water feature. The dual sided fireplace is the focal point of this luxurious space. Paint 2018. 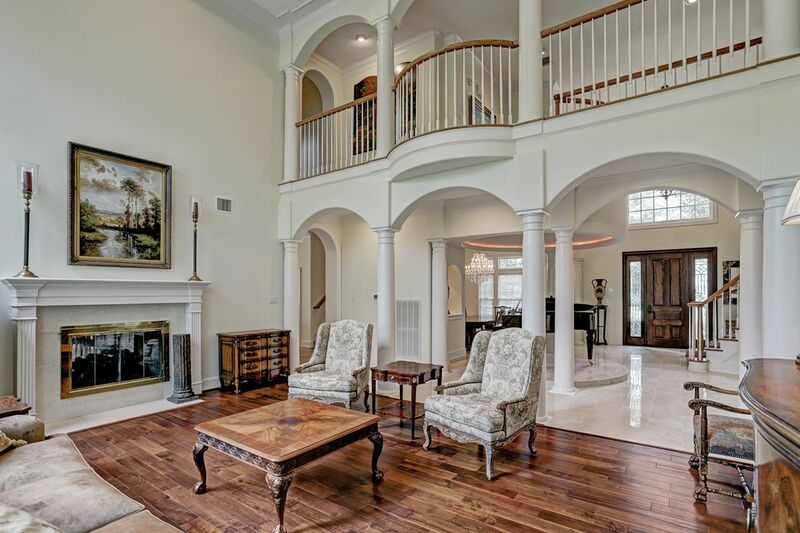 A view of the formal Living Room, featuring the dual sided fireplace, Gallery, Entry, and 2nd floor landing's Juliet balcony, overlooking the Living Room and the Entry. Gracious room for gracious living. Paint 2018. 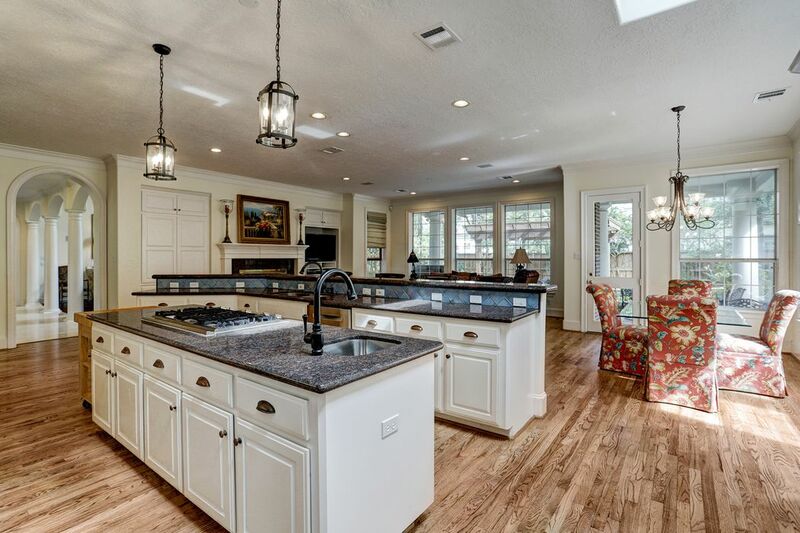 Gleaming hardwood floor, dual granite islands, recent appliances (2018), and an exceptional open layout make this living space ideal for casual entertaining. 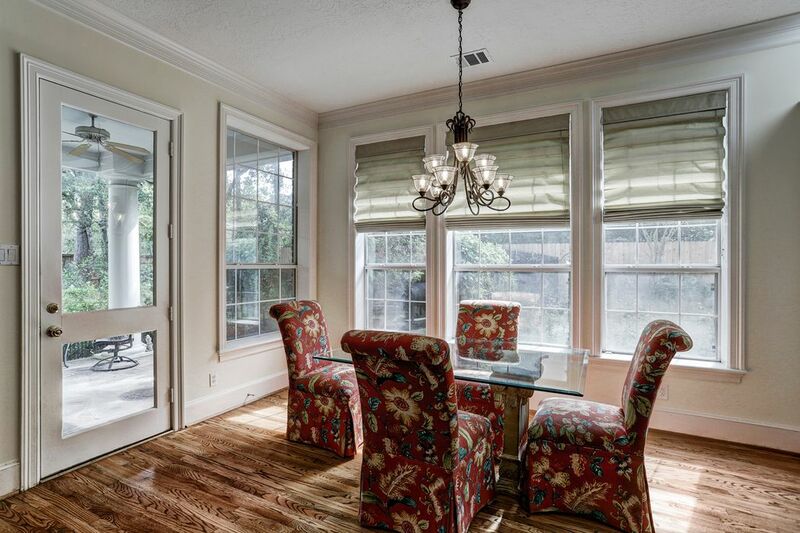 The French door leads to the “secret garden” with both covered and uncovered garden spaces. 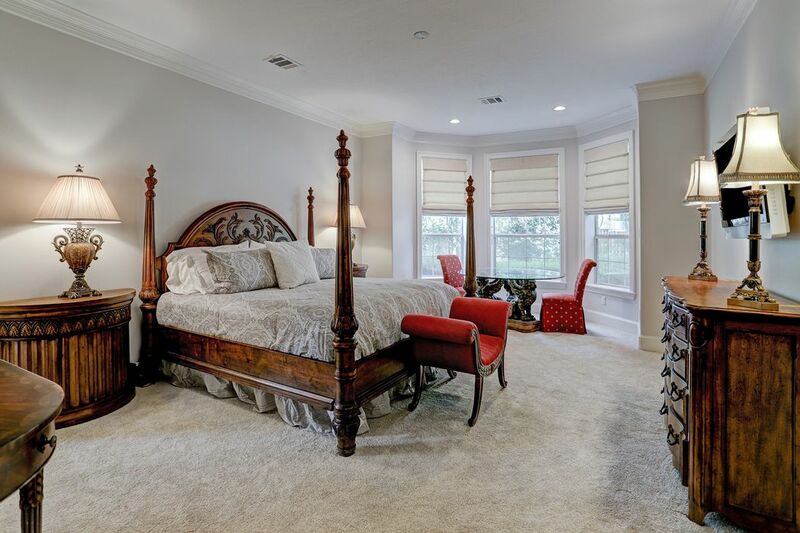 The Master Bedroom (22 x 15) boasts large bay window in the siting area with custom shades, crown molding and gorgeous views of the lushly landscaped backyard. 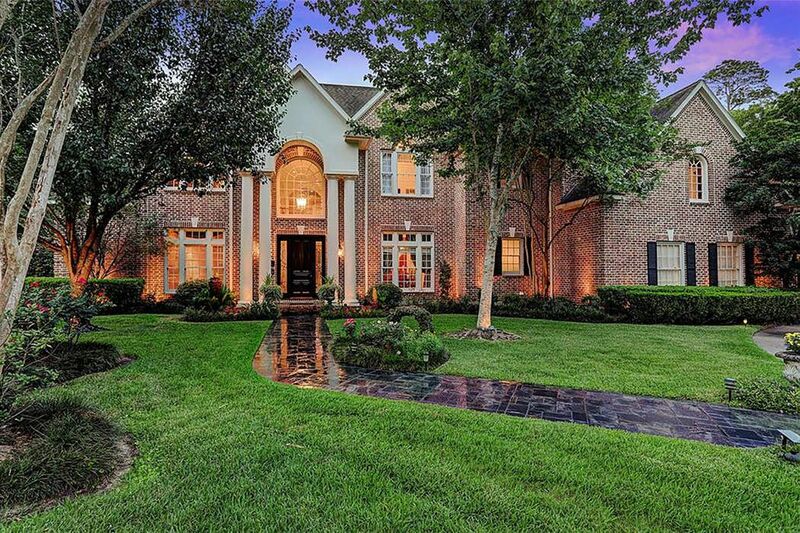 Serene setting for this exceptional traditional home. Paint and carpet 2018. 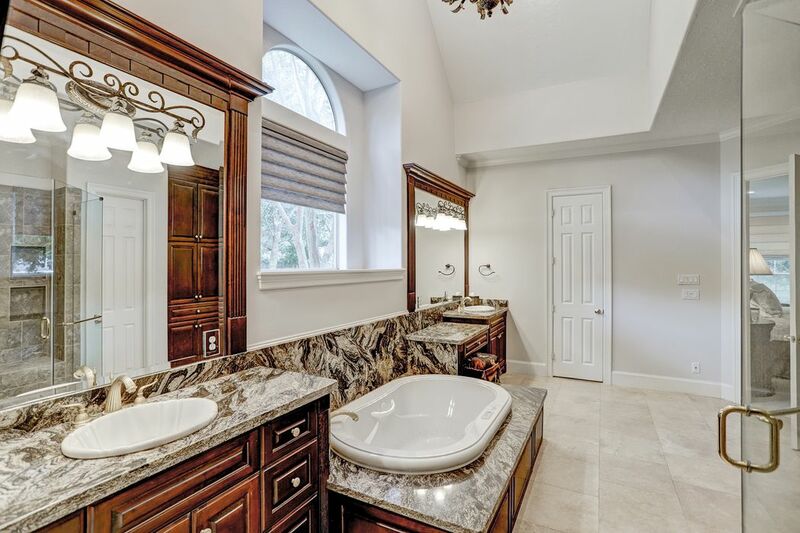 The Master Bath has two large walk in closets with single and double hanging rods, dual granite vanities and make up knee space, bubbler tub and large separate shower with frameless glass enclosure. Paint 2018. The Master Bath as viewed toward the bubbler tub. 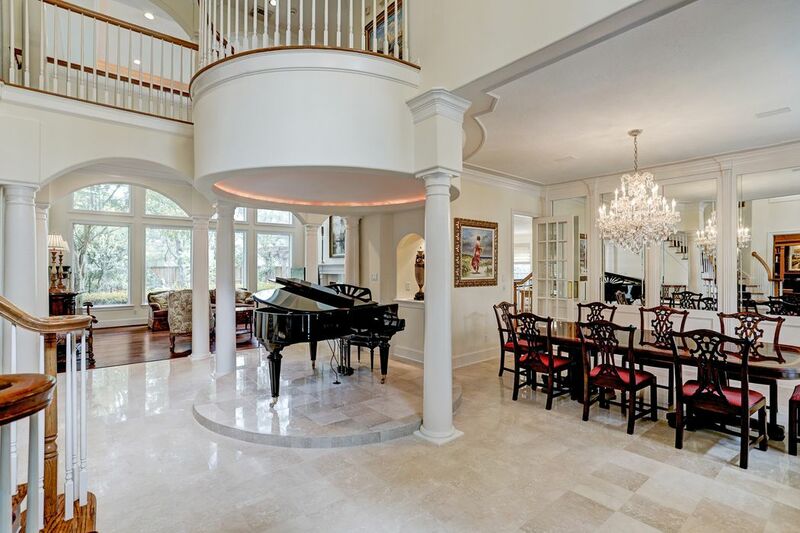 Note the high ceiling and arched window, recent decorative lighting and travertine floor. Paint 2018. One of the secondary bedrooms has a LOFT and this image is from the loft. 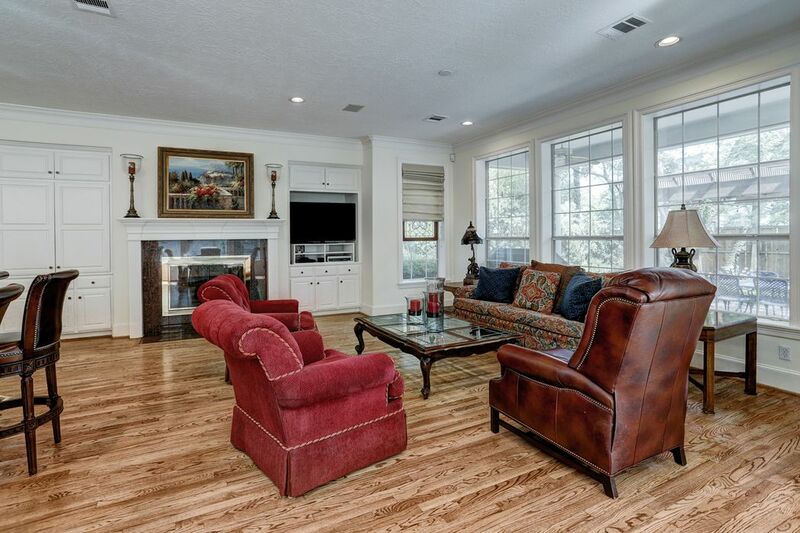 High ceiling, large walk in closet (closed door) and private en suite bath. 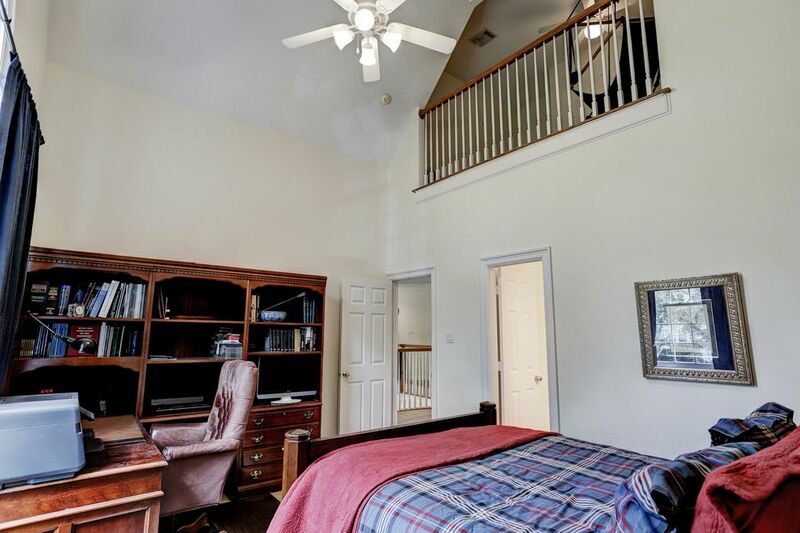 One of the secondary bedrooms boasts a loft, accessible from a ladder in the en-suite bathroom, with a high cathedral ceiling with (ceiling fan and light fixture) and a large walk-in closet (out of view). 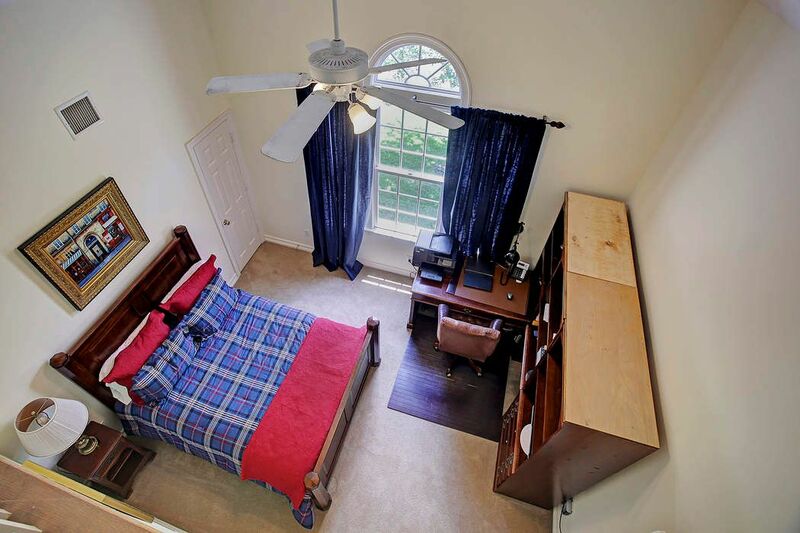 One of the secondary Bedroom (located upstairs) has a window seat, large walk in closet and en suite bath. 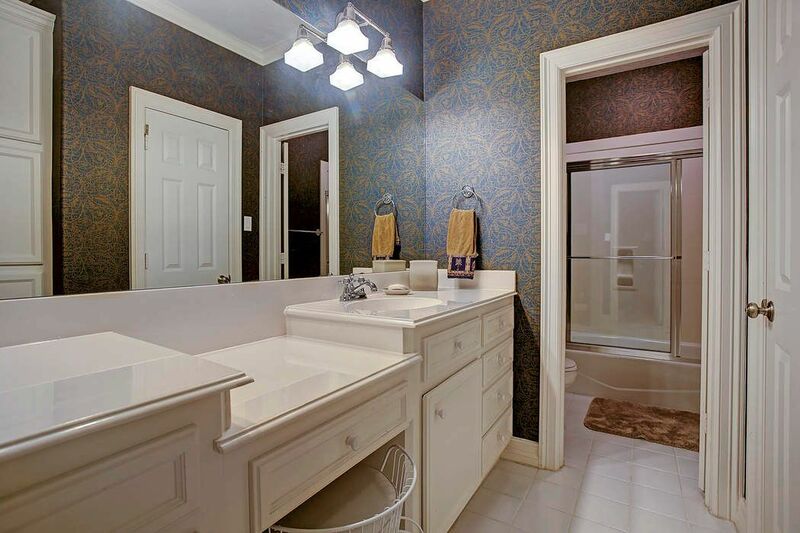 The bath is also accessible to the Media Room with Wet Bar. Paint 2018. The en suite bath has a large separate vanity area and private room with toilet and tub/shower. This bath is also accessible from the Media Room/Pub. Wow! Is this a MEDIA ROOM or a PUB? The dark ceiling and walls make this feel like a professional theatre. Two large closets, large wet bar/kitchenette with microwave, sink and ice maker . Movie night at your house! 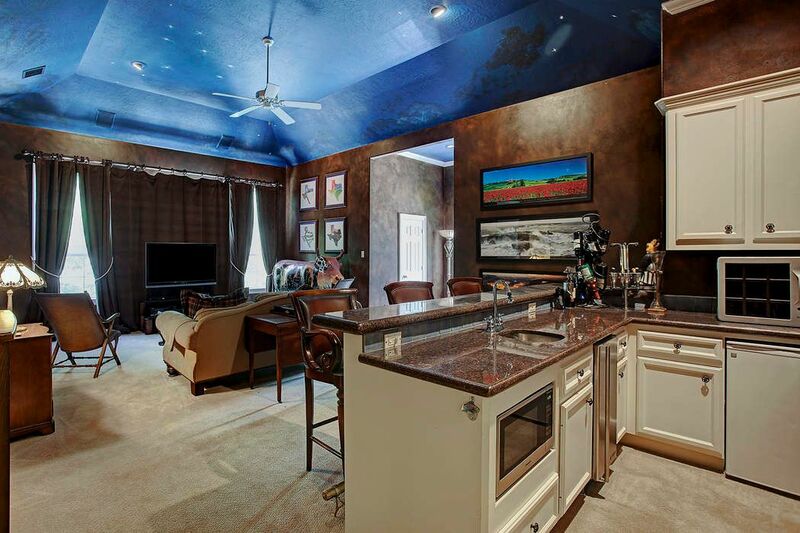 The Media Room as viewed toward the seating area and the wet bar. 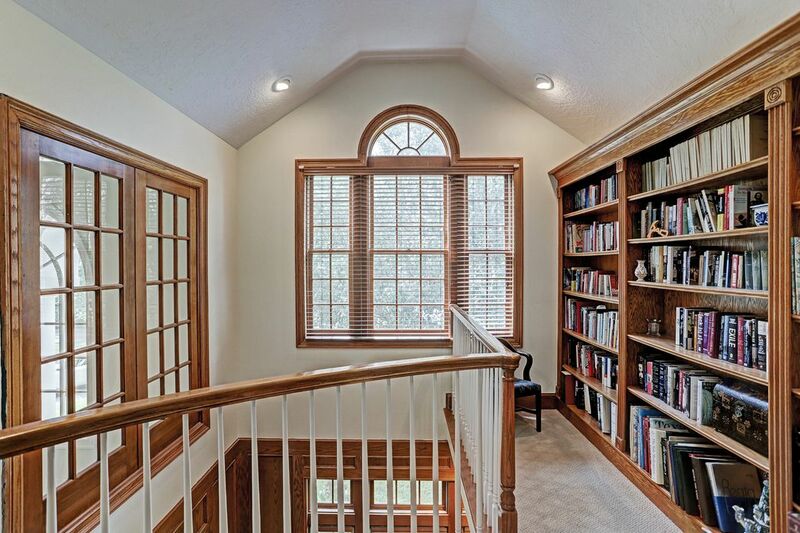 There are two large storage closets in the dormer area and divided light French doors to the hall leading to the secondary bedrooms and exercise room. 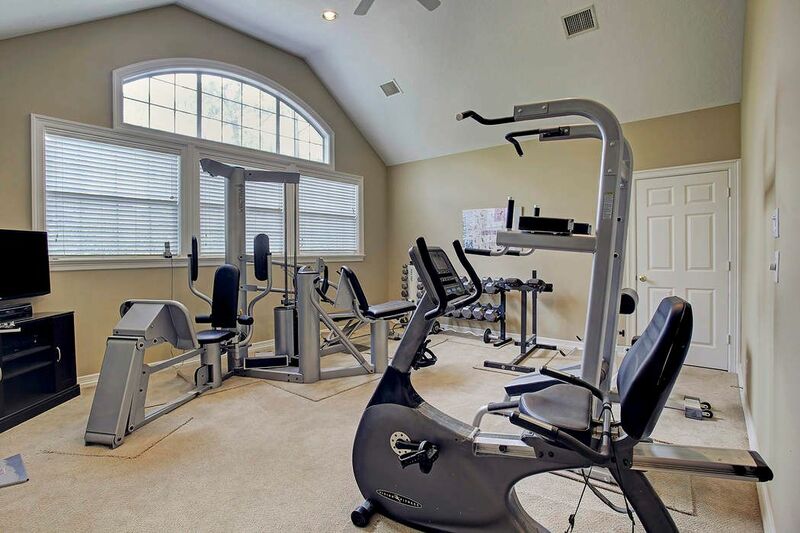 Located upstairs is the exercise/bonus/flex room (17 x 15) with two large closets. 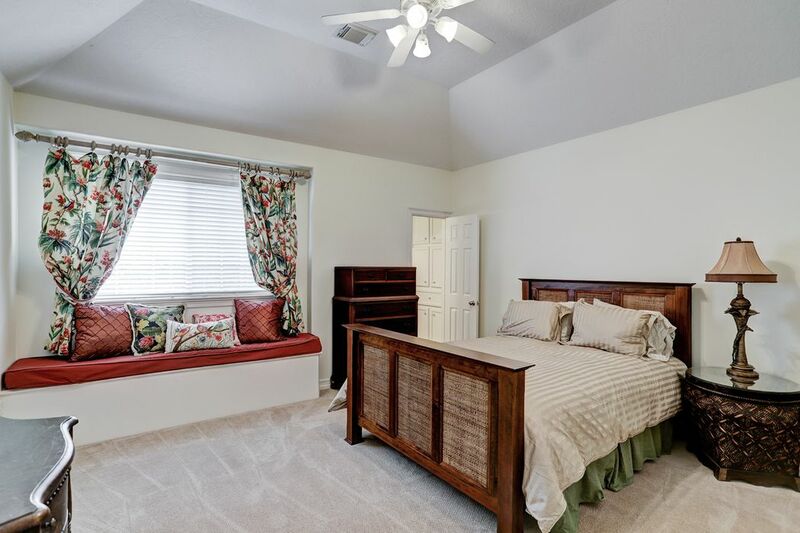 High ceiling, ceiling fan and carpet too. Wow, beyond the gardens is the grassy side yard. Plenty of space ideal for pets, Swingset, playground equipment and maybe even a FUTURE SWIMMING POOL. 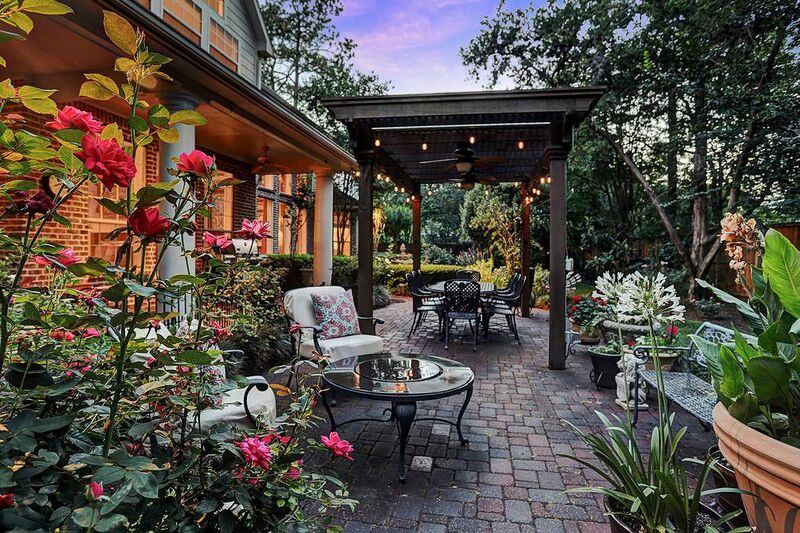 The backyard is reminiscent of the “Secret Garden” with pergola for “alfresco”dining, covered back porch, fountain and lushly landscaped covered and uncovered areas. Truly magical. 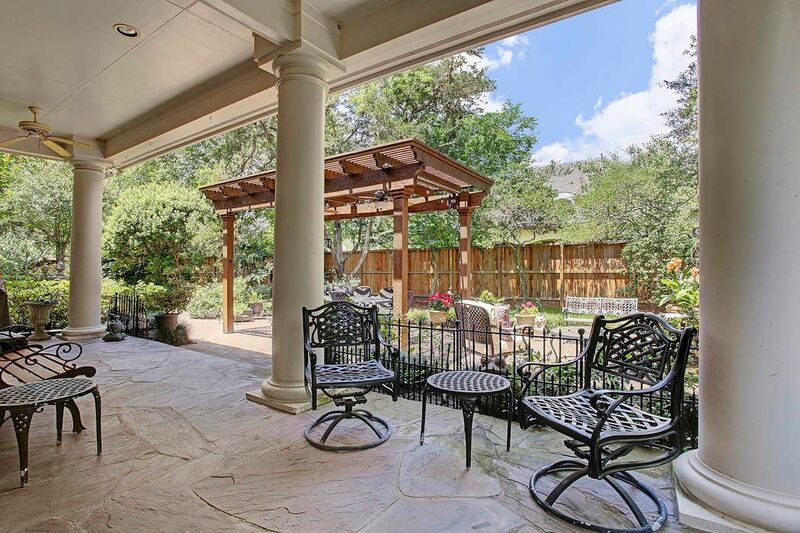 The covered patio as viewed from the French door leading to the incredible gardens including deep covered patio, pergola, covered grilling area, fountain and large side yard for Swingset, fort or future pool. 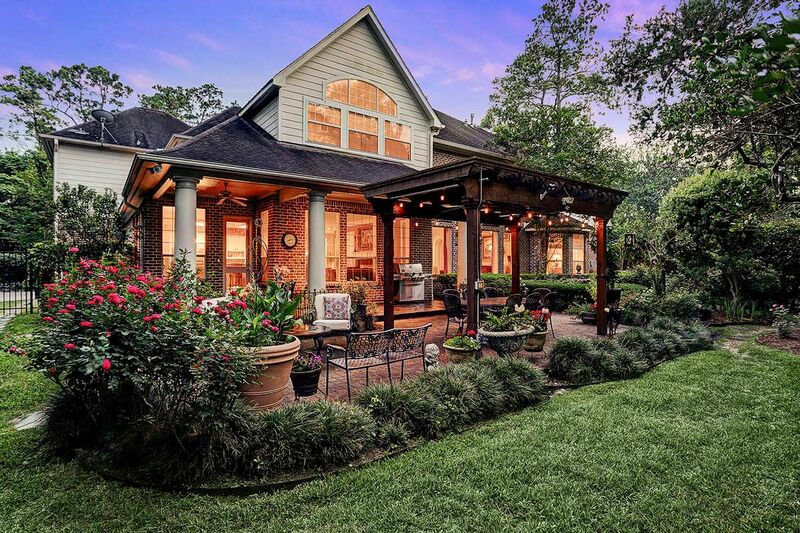 Truly magical gardens with brick paved walkways, pergola with dining area below, fountain surrounded by flowers and lovely open spaces for pets, Swingset, fort and even a future swimming pool. 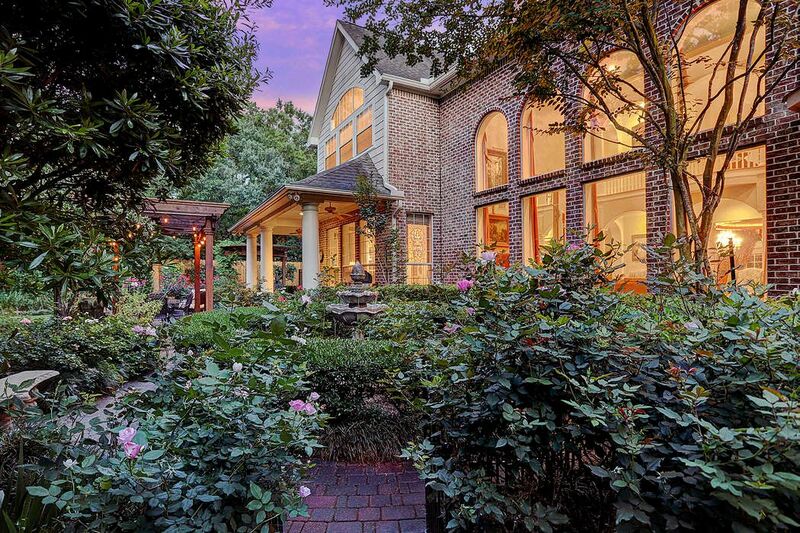 Lushly landscaped gardens as viewed toward the 2-story Living Room windows. 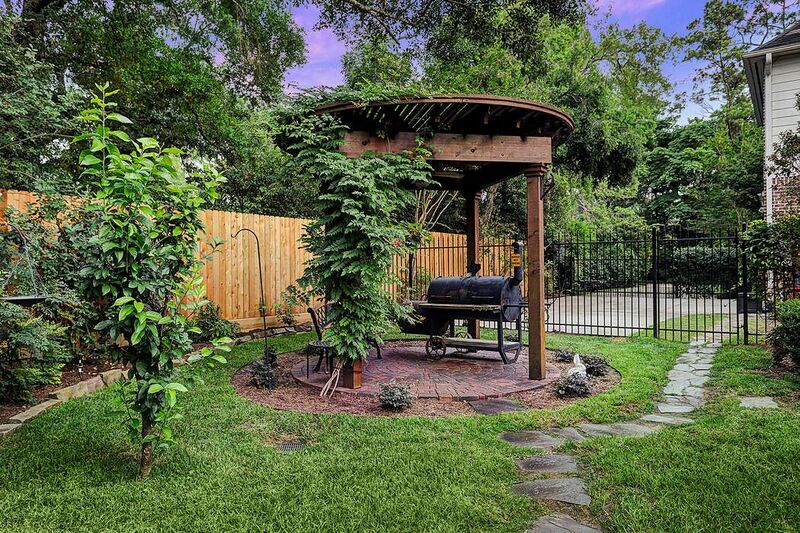 Hard to find words to describe the natural beauty in this yard. Truly an exceptional setting. 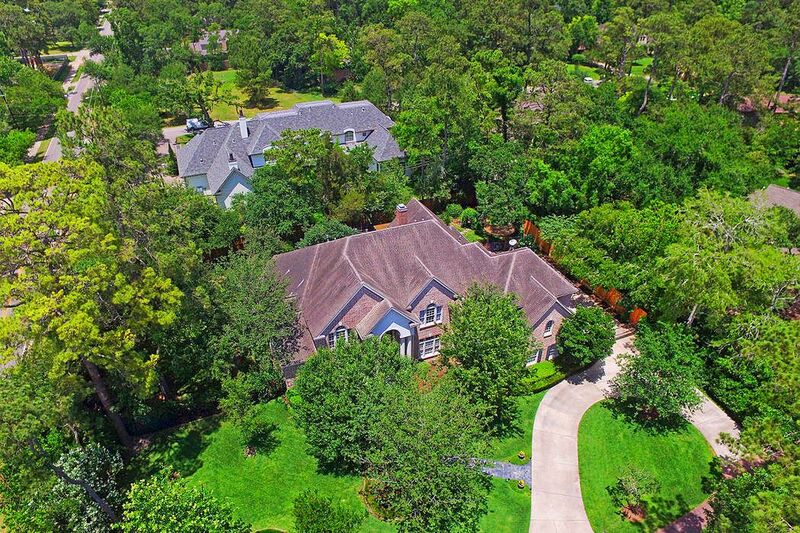 Variety is the spice of life and that is evident in the variety of florals found in this .7 acre lot. Exceptional SPRING BRANCH ISD Schools too: Memorial Drive Elementary, Spring Branch Middle and Memorial High School. 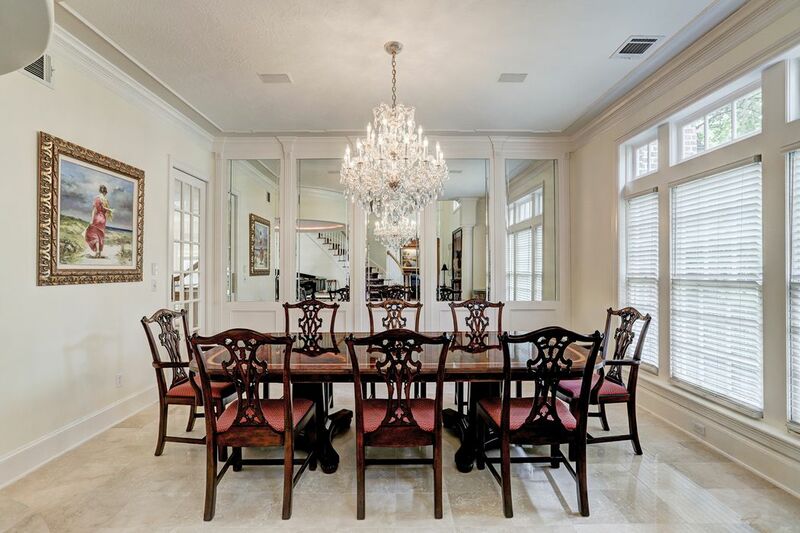 $2,000,000 4 Bedrooms4 Full / 2 Partial Baths6,826 sq. 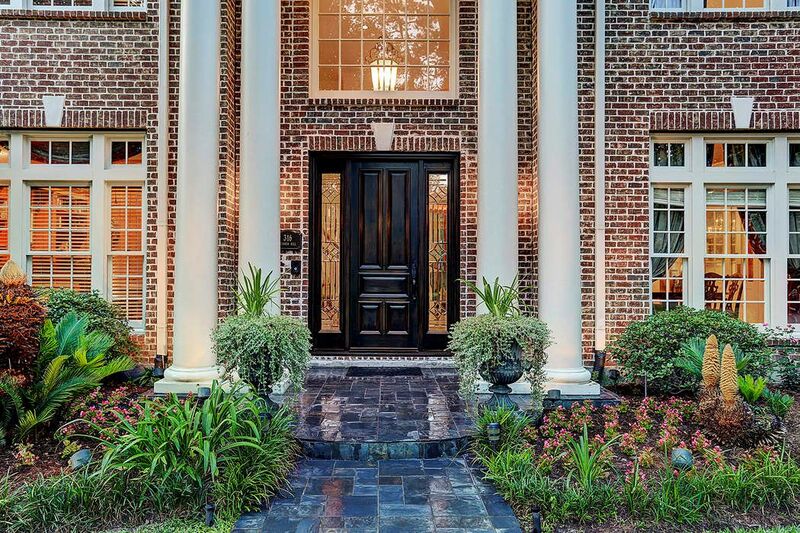 ft.
Elegance and luxury abound in this stately, traditional residence on a secluded private drive, just off Bunker Hill Road. 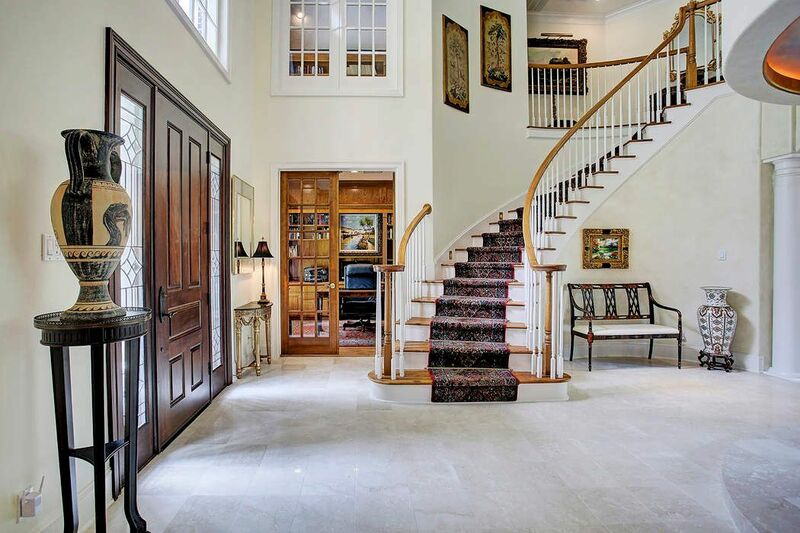 Solid wooden entry door leads to the grand two-story entry with sweeping staircase. 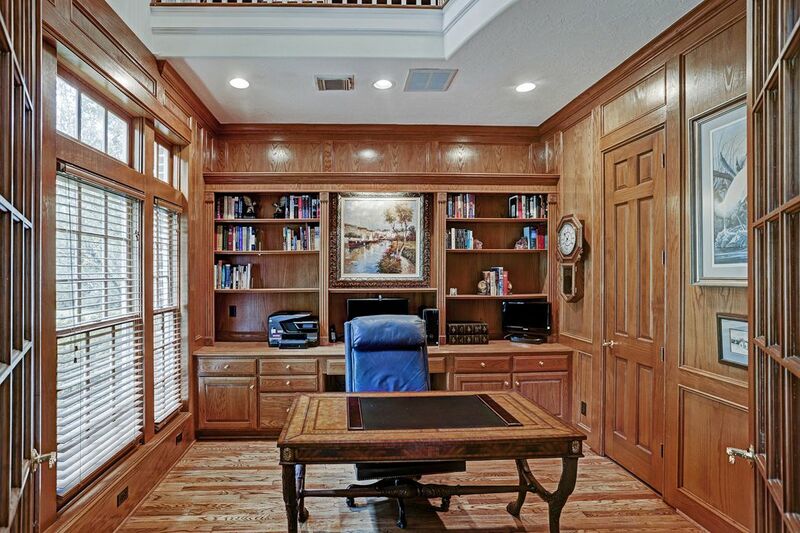 Light and bright paneled study with built-ins and library loft above, situated at the entry, is an ideal home-office. 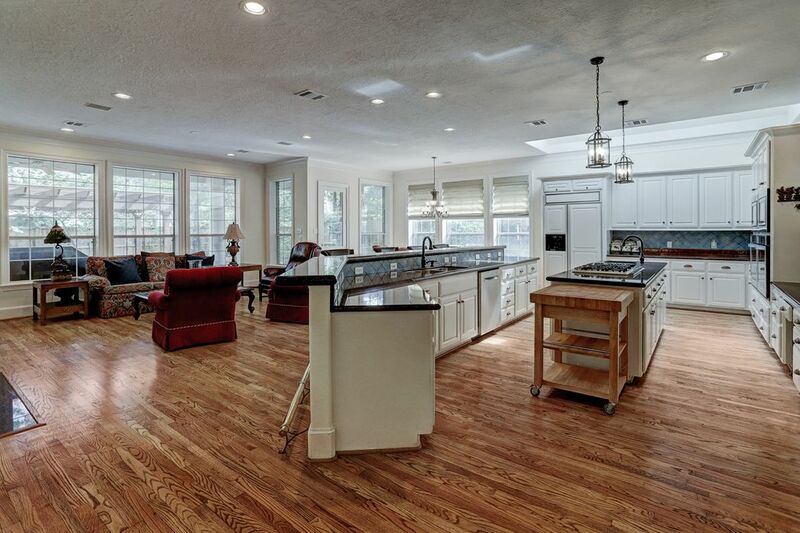 Formal dining room leads to the kitchen, breakfast, and family rooms via a butler’s pantry with granite counter. 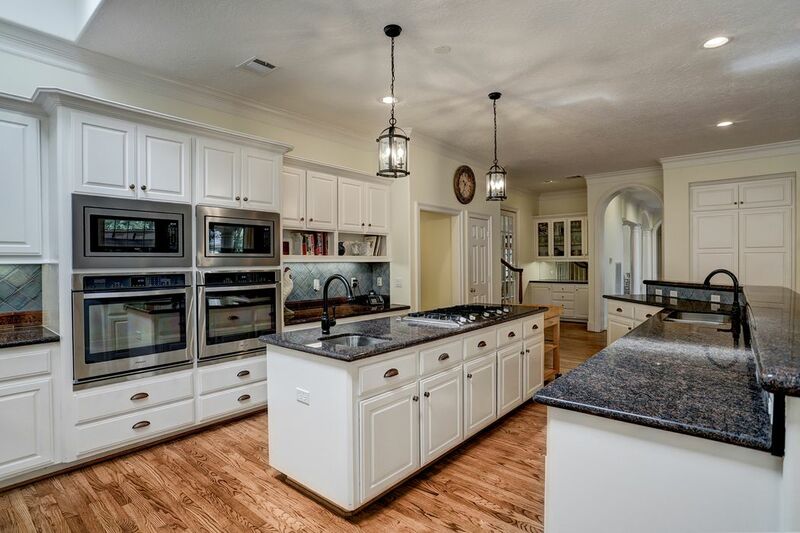 Well-appointed gourmet kitchen opens to family and breakfast rooms and includes paneled KitchenAid refrigerator, matching stainless steel convection ovens and microwaves (2018), Bosch stainless steel dishwasher (2018), bar seating to the family room and a large granite island with prep sink and Dacor stainless steel five-burner gas cook top (2018) with telescoping vent hood. 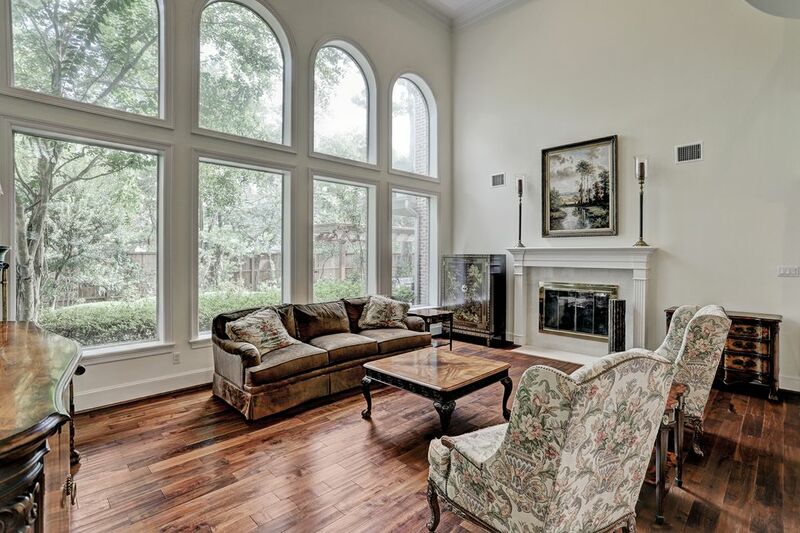 Family room features dual-sided gas log fireplace to the formal two-story living room with wall of windows. 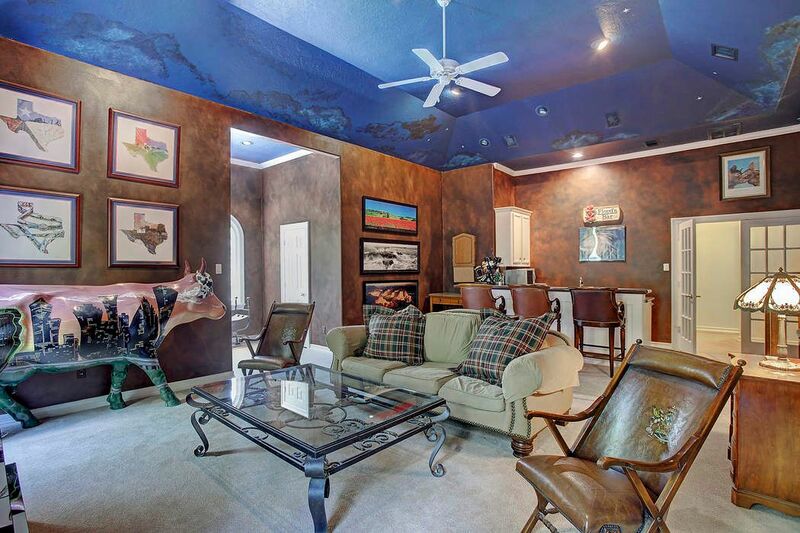 Ample parking inside privacy gates plus additional parking in the circular driveway and three-car attached garage. 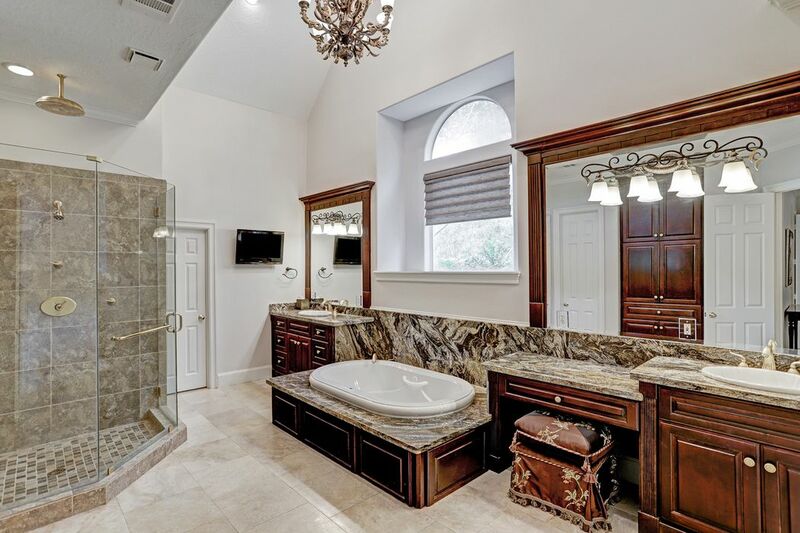 Master suite includes sitting area, spa-inspired bath with dual granite vanities, separate shower, jetted tub and two closets with built-ins. Private water closet is accessible from the study. Beds two, three and four on the second floor, each with en suite baths and Bed three with extra private loft area (not included in the square footage). 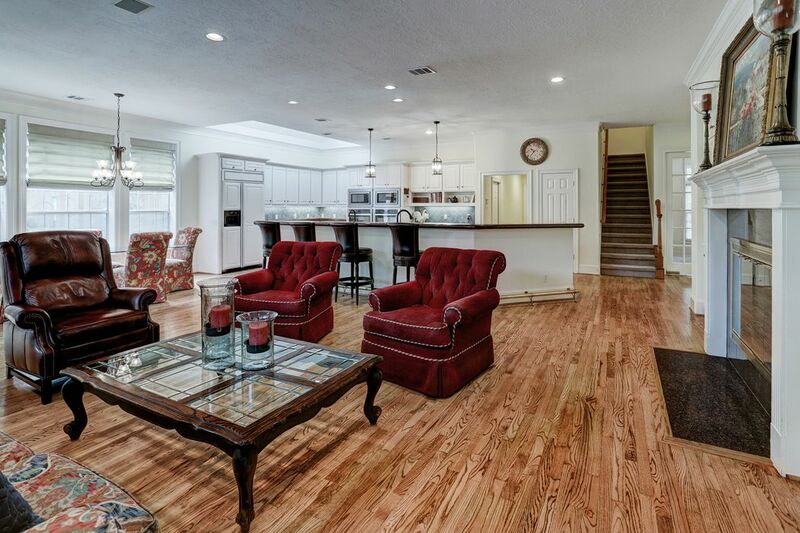 Large second floor multi- purpose game room currently set up as an exercise room overlooks the lushly landscaped back yard with covered patio, multiple gardens, expertly installed drainage and enough green space for a pool. Game/media room attaches to a bath and could be bedroom five, plus features a wet bar with high-end ice maker (2018), microwave, beverage refrigerator – perfect for movie night. 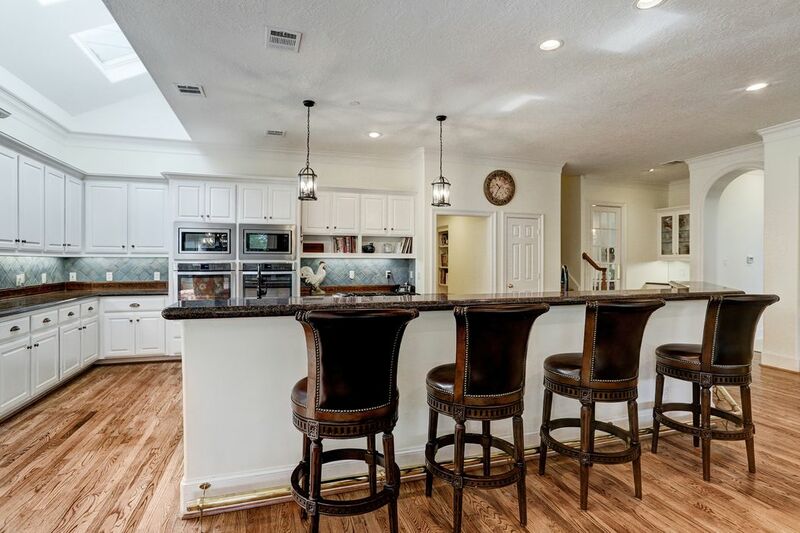 Tons of storage, natural light, plenty of parking, and multiple entertainment spaces both inside and out are perfect for relaxing after a long day, or for entertaining any sized gathering. Never flooded, per Seller.